Last week I went to a class on Stream Erosion. What they used is called a stream table . It was a slanted table full of sand with a faucet on the top. There was 2 types of streams: the young stream and an older stream. The difference is the older one has been carved out a little by water. Stream erosion is when water overflows a stream, the faster parts carry the boulders and the cobbles and the slower water carries the pebbles, sand, silt, and clay. And this how a stream in the real world takes shape. 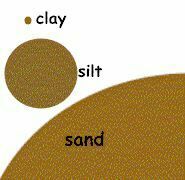 Look how small clay is, I bet you didn’t know that!